Cattle Penning - not yet available in South Australia. Aspire to good horsemanship: no matter the breed of horse or style of riding. It is a cosmopolitan sport aimed at saving the tradition of working horses around the world. Working Equitation is a fun way to test the partnership between you and your horse. In competition they sensibly allow the horses to be accustomed to the obstacles and equipment before riding the course. When food on your plate looks attractive you want to eat it and when a Working Equitation obstacle course looks attractive you want to ride it. Well we have some very nice eye candy for our riders that's for sure, and please bring a favorite CD you like to ride to. We also give private and share lessons in Working Equitation. In 2014 we have introduced riders using our school masters and riders on their own horses to this fascinating and great fun sport that is taking the world by storm. Each Funday Sunday that we have held so far has been booked out. Lots of photos on our two Facebook pages. We offer private & share WEq lessons plus Funday Sundays. You can book ahead for any of the sessions. Always something different, a new obstacle course each time, lots to learn and fun guaranteed. 6 riders maximum on the Funday Sundays. Up-to-date info of WEq events and the dates they are to be held are written up in our Newsletters. 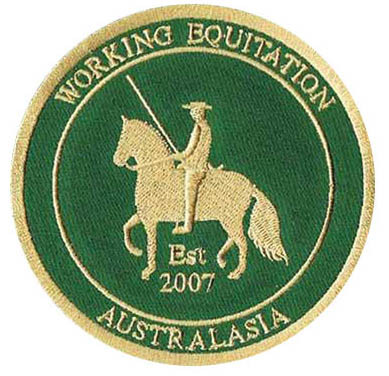 Gill Kennerley, International classical Dressage trainer from the UK introduced Working Equitation to Australia in 2006 and Founded 'Working Equitation Australasia'. As Gill says "Working Equitation is a fun way to train seriously". Working Equitation is designed to test horse and rider, through a range of activities combining flat work [Dressage] movements; and obstacle tests where horse and rider negotiate a number of obstacles similar to those encountered whilst working on a property - including 2 phases, one slow for accuracy and with style, and the other being against the clock for skilled riders and highly trained horses. The obstacle courses can include: Ride figure of eight around 2 drums, Slalom around bending poles, Collect a pole from a drum, Use pole to knock a ball off or collect a ring from a free standing obstacle, Use a pole to collect a ring from a free standing Bull, Replace pole and rings to a drum, Negotiate a wooden bridge, Open and close a gate without letting go; Ring a bell at the end of a corridor and rein back out, Jump over straw bales, Ride around a livestock pen, Walk sideways over a pole or poles placed on the ground, Ride a cloverleaf, negotiate a water obstacle, a bank, switching a glass from one tip of a pole to another, . Initially for less experienced horses and/or riders the obstacles are ridden with two reins, two hands. The ultimate aim and most advanced level is to ride the horse in collection, at walk and canter, riding with one hand only, (left hand) throughout the test. After the completion of the dressage phase a rider is required to demonstrate horsemanship skills in the ease of handling/quality obstacle phase and should display harmony, collection, roundness and suppleness while doing the obstacle course. There are different levels from novice to advanced, open to handlers leading from the ground, leading rein for all ages, all styles of riders, equipment and attire, and open to all breeds of horses. In competition you can have Individuals and also Teams. With our classical background we are keen to establish Working Equitation Training in South Australia, it is challenging and a lot of fun. Students on School Masters of the Academy and riders with their own horses are all welcome. Further training of your horse under saddle also available.